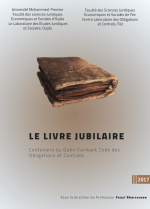 Last year I heard about the plans for a new legal history journal, the Revue Marocaine d’Histoire du Droit (RMHD). This month the happy news arrived about its upcoming launch. As I was about to write a brief announcement I read online two contributions about Morocco’s legal history, one in Dutch about the new journal in the Flemish Rechtshistorische Courant edited at Ghent University, the monthly bulletin for the legal history of the Low Countries, one at the Legal History Blog about a book published in 2014 concerning law and history in Morocco. It seems worthwhile to connect both items here with a third announcement on a volume of scholarly articles about the centenary of the Moroccan code of contractual law. Let’s start here with translating some of the words of Dirk Heirbaut (Ghent University) wrote in the Rechtshistorische Courant about the new journal led by Fouzi Rherrousse (Université Mohammed Premier Oujda): “We can only applaud this initiative for a Moroccan journal for legal history, because it will be the first of its kind in the Arab world. It will try to answer a great need. There is scarce attention for Morocco’s legal history, the subject is not included in the curriculum of the law faculties. It is to be hoped that the new journal changes this situation and gives an impulse to the study of legal history in Morocco and elsewhere in the Arab world. In a globalising world this is also important for European legal historians”. A number of European scholars has joined the comité de lecture, and others are even members of the editorial board. By some lucky coincidence the Legal History Blog posted a brief announcement about a book the ever-vigilant team of this very active blog apparently had missed earlier. They wanted to make good this omission, for they deem it an important study. The book in question is Etty Terem, Old Texts, New Practices: Islamic Reform in Modern Morocco (Stanford, 2014). At the publisher’s website you can read the summary, the first chapter and the start of the second chapter. Terem studied a book in eleven volumes published in 1910 by a Moroccan scholar, al-Mahdi al-Wazzani (1849-1923) called al-Mi`yār al-jadīd, the “New Standard Measure”. Al-Wazzani collected many thousand fatwās, legal decisions, pertaining to Mālikī law. He did this just before France got de facto hold of a large part of Morocco. The treaty of Fez in 1912 divided Morocco into a French and Spanish protectorate, apart from the international enclave Tanger and a number of other ports. Terem invites you to look closely at the role, meaning, interpretation and impact of this massive legal collection. The centenary volume I mentioned above [Le Livre jubilaire. Centenaire du Dahir formant Code des Obligations et Contrats, Fouzi Rherrousse (ed.) (Oujda 2017)] was signalled at Histoire du Droit des Colonies, a French portal for colonial legal history. The Dahir was officially published on August 12, 1913. The delay between the centenary and the publication of this scholarly volume does certainly not diminish its importance. In the first section scholars write about contract law and obligations as an element of European legal history, and about different ways of codification in past and present, literally from classical Antiquity to the twenty-first century. The second section contains nine articles on the Code des obligations et des contrats, for example on the preparation by French lawyers of this code of law, Spanish influences, the impact of Roman law, the role of an Italian lawyer, and also the role of this code between law and economic influences. The website Histoire du droit des colonies alerts also to the 2016 international conference Regards croisés sur l’histoire du droit [Different regards on legal history] held at Oujda. It underlines the role of a series of centenaries in Morocco’s legal history, with not only the Dahir, but also the first official gazette, the Bulletin officiel. The organizers rightly deplored the absence of legal history at the law faculties, only ancient law is an obligatory subject. They want to free the subject from rough generalisations, shame and confusion about the past of Morocco, and the danger of unreflected changes in current law. Blog posts are usually not long, and I am afraid my average posts are much longer than many readers will expect, but this time I think it is better to offer only a short contribution to be continued at some point in the near future. Pursuing this path will ask some real efforts, think only of the variety in transliteration of Arab names and book titles. There exists a recent selection of texts by Islamic lawyers from the past, Islamic legal thought : a compendium of Muslim jurists, Oussama Arabi, David S. Powers and Susan A. Spectorsky (eds.) (Leiden 2013) to which Etty Terem contributed a fragment from the opus magnum of al-Mahdi al-Wazzani. You might also want to Iook at the French website Colonialcorpus. The most recent issue of the online legal history journal Clio@Themis contains articles in several languages around the theme Revues et empires coloniaux. I have not yet found a web page or website for the new Revue Marocaine d’Histoire du Droit, nor has the first issue appeared in print, but nevertheless I want to wish Fouzi Rherrousse and his team good luck in paving the roads for more space for and more attention to the legal history of Morocco, North Africa and the Arab world. In the autumn of 2017 a study by Dan E. Stigall, The Santillana Codes: the Civil Codes of Tunisia, Morocco, and Mauritania (Lanham, MD, 2017) will appear. Not only the civil law of Morocco, but also the role of the cosmopolitan Tunisian lawyer David Santillana (1855-1931) will be highlighted. You can read a very interesting about this book in a post at the blog of the Friends of the Library of Congress, the library where Stigall did his research for this new book. This entry was posted in Peoples and tagged Africa, Colonial history, France, Islamic law, Legal history, Legal journals, Middle East, Morocco on June 9, 2017 by rechtsgeschiedenis.